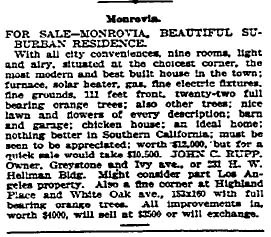 The Times real estate section takes a look at what was then the distant suburb of Monrovia, 22 miles from downtown Los Angeles. The writer notes the increasing use of concrete and stone, explai ning that the cost of lumber is forcing builders to use other materials. The writer also notes the broad, shaded verandas of three featured homes as well as the outlines of their roofs. 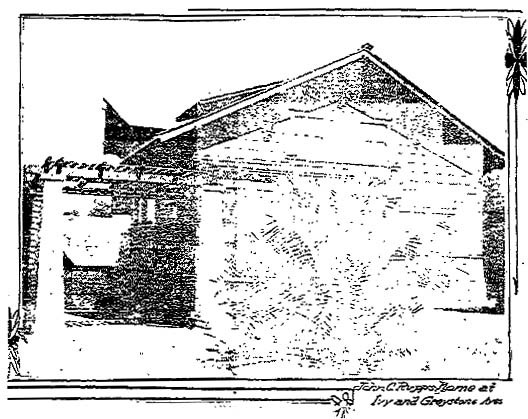 The story highlights the home of B.R. Davisson on East Orange Avenue, H.M. Slemmons (or Slemon) on North Myrtle Avenue and the home of John C. Rupp at Ivy and Greystone, built for $6,500 ($133,403.21 USD 2005). that it is still standing and in beautiful condition. In fact, it was nice to discover that the neighborhood has quite a few well-maintained historic homes; a contrast to the condition of the houses I located in Pico Heights. Despite the efforts of 75 volunteer firefighters, a blaze rapidly consumed a 150-foot wooden bridge on Foothill Boulevard over the Santa Anita between Arcadia and Monrovia.